The mission of the Poker TDA is to adopt basic standards, rules and procedures that will positively impact the Poker Industry. In this process, tournament directors, players and the media are periodically invited to discuss, evaluate and vote on proposed rules. 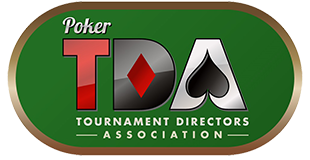 The TDA is comprised of poker room personnel from around the world whose objective is to draft a standardized set of rules for poker tournaments. The TDA meets semi-annually to discuss the addition of new rules and to amend or eliminate current rules. The TDA was founded in 2001 by Matt Savage, David Lamb, Linda Johnson and Jan Fisher.